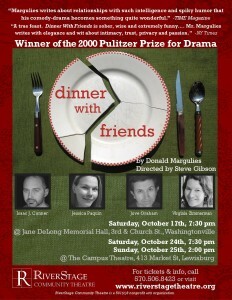 RiverStage Community Theatre will present the Pulitzer Prize-winning drama Dinner With Friends by Donald Margulies on October 17, 24 and 25. Performances will be at the Jane E. Delong Memorial Hall, 3rd and Church Streets, Washingtonville on Saturday, October 17 at 7:30pm, and at the Campus Theatre, 413 Market Street, Lewisburg on Saturday, October 24 at 7:30pm and Sunday, October 25 at 2:00pm. Tickets are $15 for general admission seating with discounts available for groups and season subscriptions, and they can be purchased at the door, by phone at 570-506-8423 or at www.riverstagetheatre.org/tickets. The show features a small, powerhouse cast of 4 experienced local actors from across the Susquehanna Valley. The first married couple, Tom and Beth, is played by Isaac J. Conner of Williamsport and Jessica C. Paquin of Milton. Isaac was seen most recently in Community Theatre League’s Spamalot and has starred in area productions with RiverStage, Gaspipe Theatre Company, and the Courtyard Theatre, among others. Jessica has starred in RiverStage’s productions of All My Sons, Gypsy, and Picasso at the Lapin Agile, is a producer with Lewisburg’s Fist-In-Post Films, and brings years of performing and stand-up experience to the stage. Tom and Beth’s best friends, Gabe and Karen, are played by Jove Graham and Virginia Zimmerman, both of Lewisburg. Jove is a graduate of the Arden Theatre Company’s professional training program, appeared most recently in Steve Martin’s Picasso at the Lapin Agile as Albert Einstein, and has directed numerous RiverStage productions over the years including Fools and All My Sons. Virginia appeared in RiverStage’s Musical Comedy Murders of 1940 earlier this year, acted in and directed many productions with the theatre department at Carleton College in Minnesota, and her first novel The Rosemary Spell will be published by Clarion Books this winter. Set design and construction for this production is led by Dennis Merkle with stage management by Emily Gibson. RiverStage Community Theatre, formerly known as the Milton Area Community Theatre, was founded in 2003 as a nonprofit group of actors, directors, musicians and artists committed to bringing top-notch theatre to the Greater Susquehanna Valley. In twelve years, the group has produced 25 classic musicals, comedies and dramas, and this season is partnering with Gaspipe Theatre Company to produce a full season of five shows. After Dinner With Friends, our 2015-16 season will continue with Craig Wright’s light comedy The Pavilion, a festival of new one-act plays, the classic musical Of Thee I Sing, and will conclude with Shakespeare In the Park in summer 2016.